I love the smell of roasting chicken – and so does everyone else – if rotisserie chicken sales are any indication! I used to roast chicken in my oven. The normal way. My RV oven does not like to roast. The pan that fits my oven is very small. And although it has a lip on the pan, I fear the broth would overflow it. When I found a “recipe” for roasted chicken on Pinterest, I had a personal duh (!) moment. 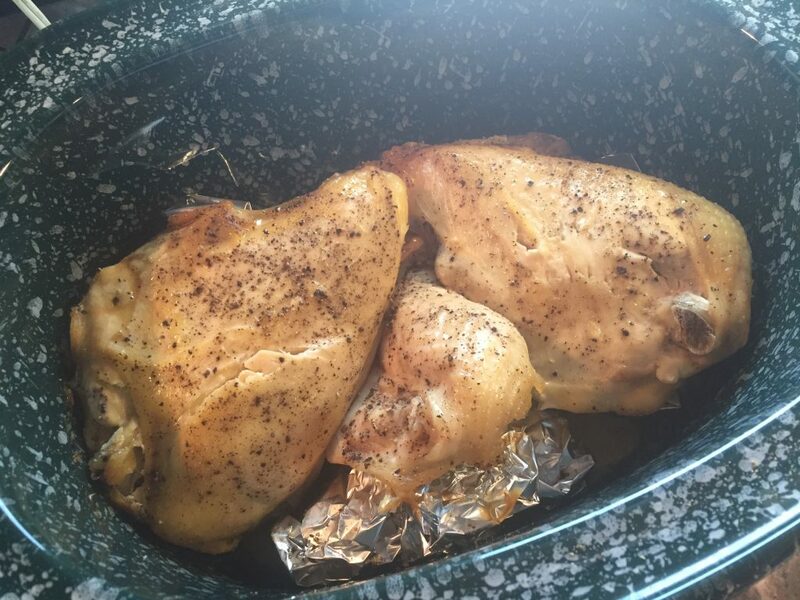 Well of course you can cook chicken (on the bone) in a slow cooker! It still smells amazing and doesn’t use up our propane. Plus, I can leave the house and come home to a meal – or the start of a meal. At our local Ingles grocery store, I can get bone-in chicken breasts with the skin on for .98/pound at least once a month. All of my bone-in chicken gets cooked this way. I usually buy a 3 pound package and end up with a little over 2 pounds of white meat. I never pull it out and measure the number of cups so it is hard to say how many cups this will yield. We often eat it for dinner and then use the leftovers for something else. Or I use it to make a recipe that will go in the freezer in the form of a freezer pack. Unwrap the raw chicken from the packaging. Rinse with cold water and pat dry. Put your slow cooker on your counter. Get out the aluminum foil. Tear off a good size sheet and crumple lightly. This should form a crumpled ball shape. 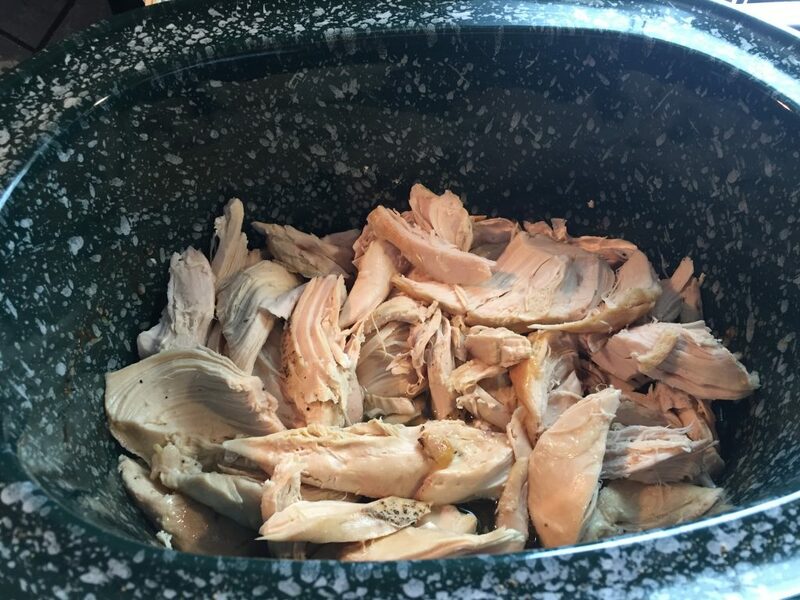 Place several of these ball size pieces of foil in the slow cooker and arrange the chicken pieces on top. Bone side down, skin side up. Sprinkle with kosher salt and fresh ground pepper if available. You can always use your favorite spice mix as well. Set the heat to low. Put the lid on the slow cooker. Let it cook for 4-6 hours on low. If you are home, you can test it for doneness by inserting a fork and twisting. If the meat falls off the bone, it is done. If the meat doesn’t fall off and clear liquid comes out, you are almost there. Give it one more hour on low or turn to high and check after 30 minutes. The cooking time depends on the thickness of the meat and that changes from package to package. 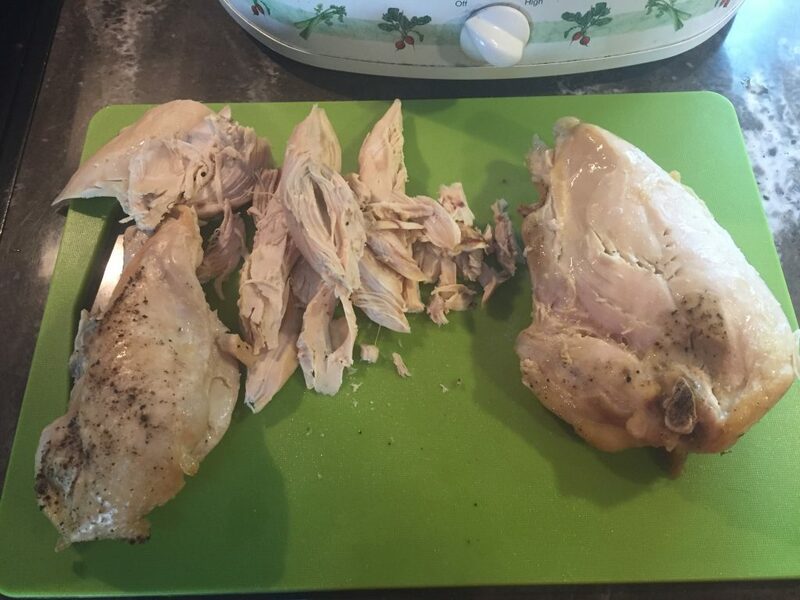 When the chicken is done, move all the chicken pieces to a cutting board. 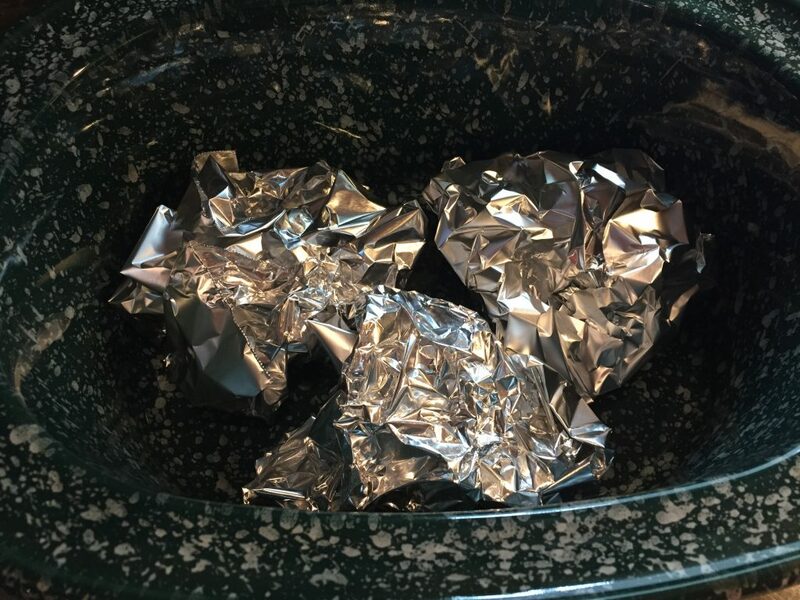 Throw away the tin foil balls, dumping the broth out as you go. Let the chicken cool until you are able to pull it off with your fingers. The chicken should just fall off in chunks. Remove the bones and the skin and discard. There are often very small bones in this cut of chicken and I have missed one before, so feel each piece as you go. 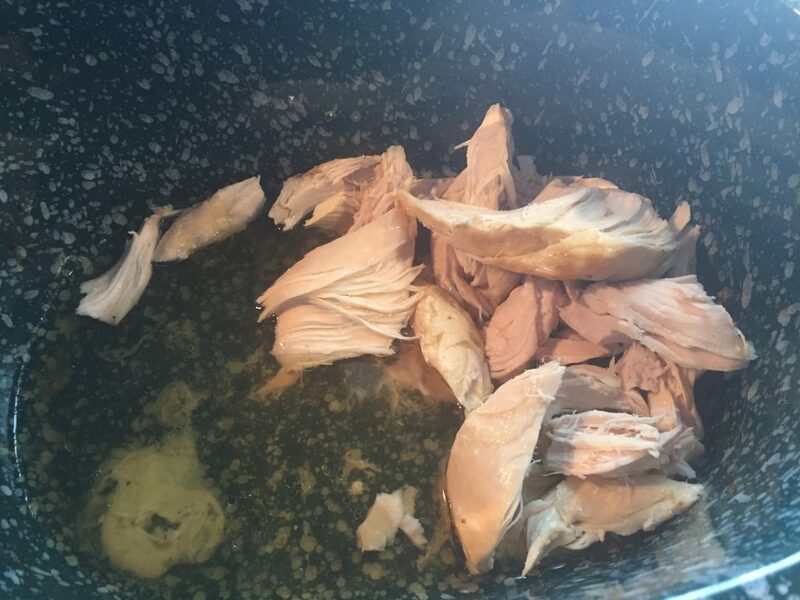 When the chicken has been pulled, return it to the slow cooker to soak up the chicken broth. There should be an inch or so in the bottom of the pan. That’s it! Now you are ready for dinner or to make something with the chicken. I used this chicken to make a batch of chicken taquitos. We had some for dinner and then I put two freezer packs away for later. I also use this method for cooking turkey breast. I usually sprinkle my turkey with some onion soup mix. My grocery store sells a split turkey breast with the bone in for about $2 a pound. I make it just like this and serve with mashed potatoes or use it in turkey pot pie. It is some serious comfort food, especially on a rainy day.